Who says owls can’t be PINK? Isn’t he adorable? 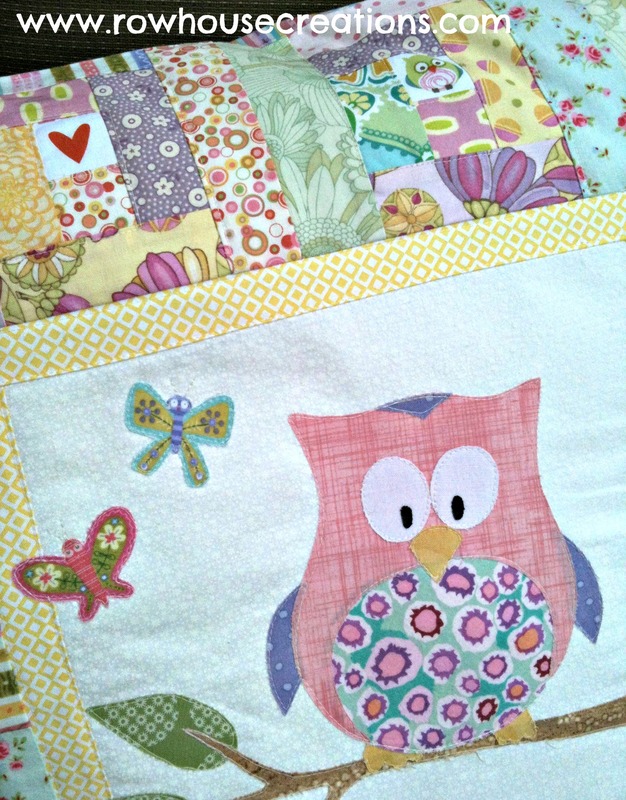 Now Trina and I want to make the entire quilt in these colors! We started a flickr group for people to share pics of the projects they make using our patterns–we’d love to have you join the group, over here! 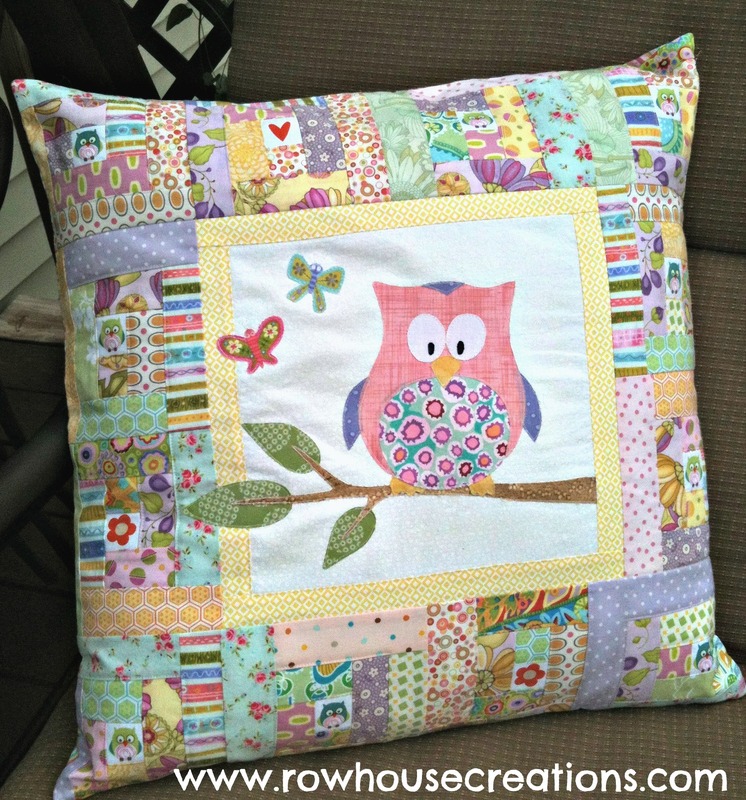 If you’d like to see more pillow pics, including some with the cute little recipient of this pillow, check out my blog. Modern Fortune, our newest pattern release is hot off the press and in the Shop! 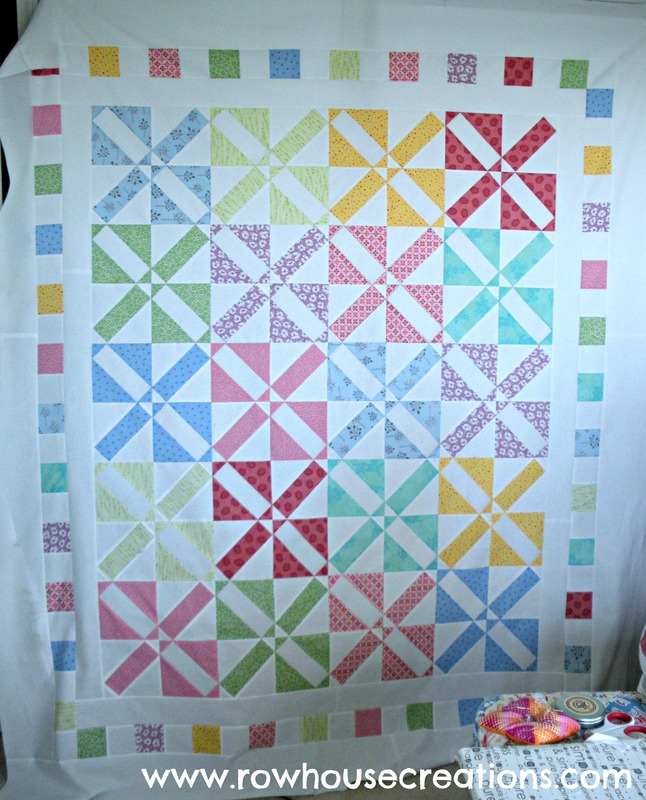 Pattern includes size options for a Baby, Twin, Queen or King quilt. 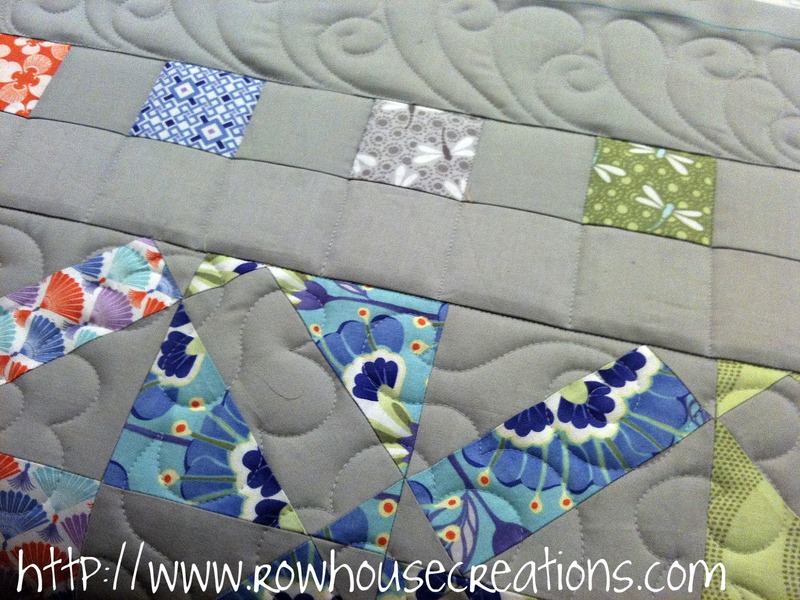 Based on a traditional block called Good Fortune, the piecing for this quilt goes quickly and is adaptable to just about any size you might want to make! 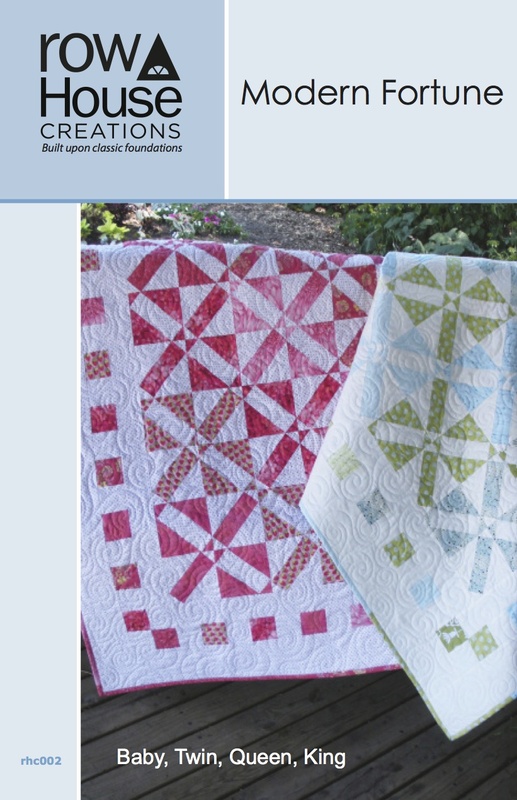 And version #4 and #5 are the pink and white and blue/green and white quilts that made the pattern cover. 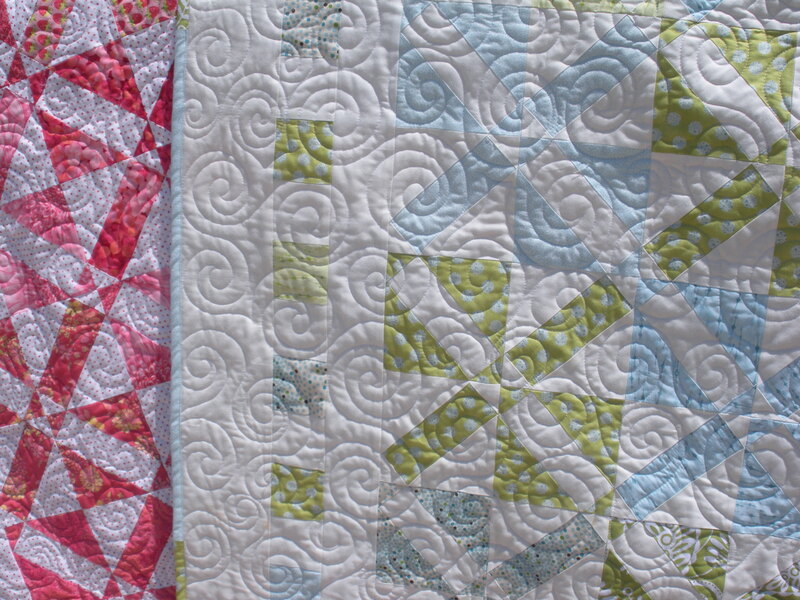 Each and every one of these are beautiful quilts! 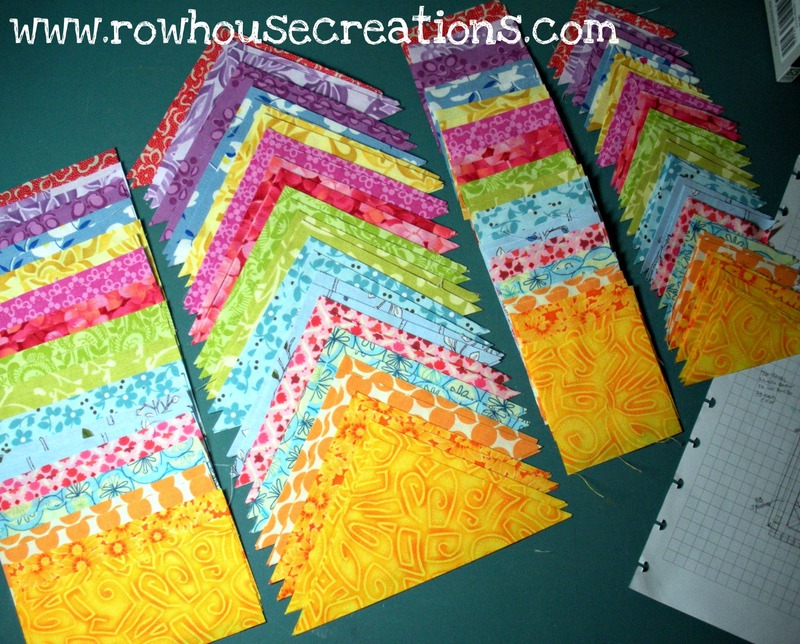 Or join our Flickr Group…, or send us an email, rowhousecreations@yahoo.com, asking to be added to our mailing list! You’ll want to know when this pattern goes on sale– I have a feeling the first print run is going to sell quickly! 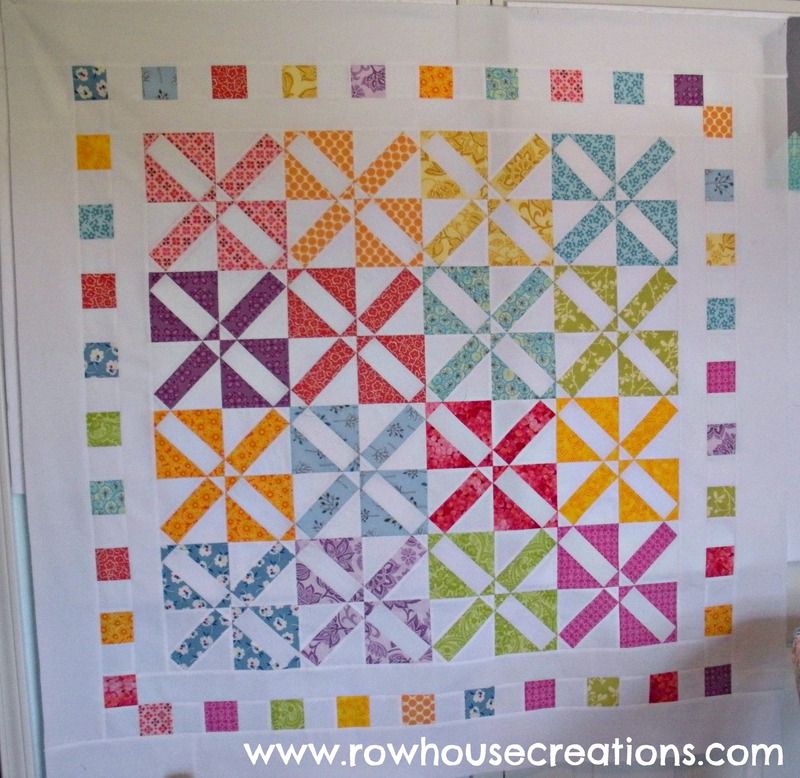 There is a giveaway of our One Big Cabin pattern over at Sherry’s blog. You have until Saturday to enter! And we are anticipating publishing PATTERN #2 next week! Whoot, whoot! Stay tuned for the big announcement. 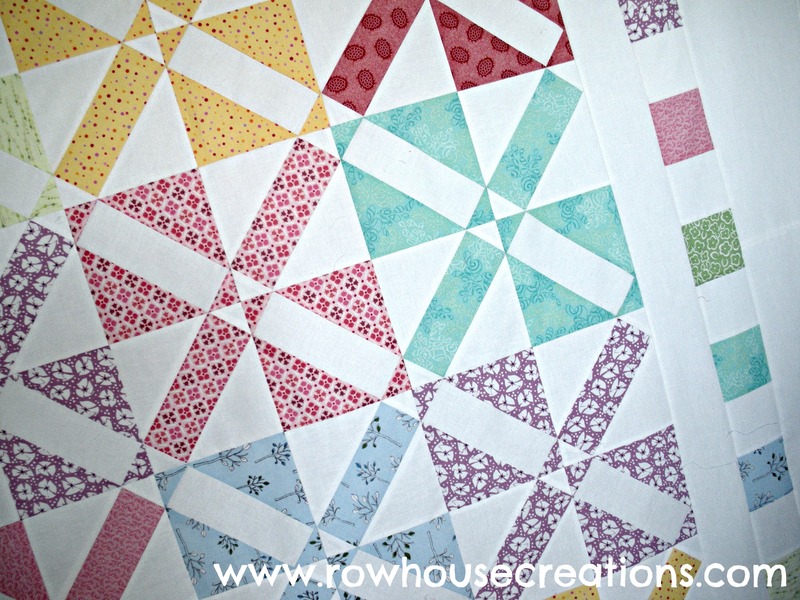 We started working on our second pattern in January, and we made a sample using a layer cake of Kate Spain’s Good Fortune line of fabric by Moda. At the time, we thought this would be our cover quilt. We believed we’d have it printed and on the market by mid-June. For various reasons, we decided that it didn’t make the cut. Not as the cover quilt, anyway. So we made a second version, with modifications to size and assembly method. 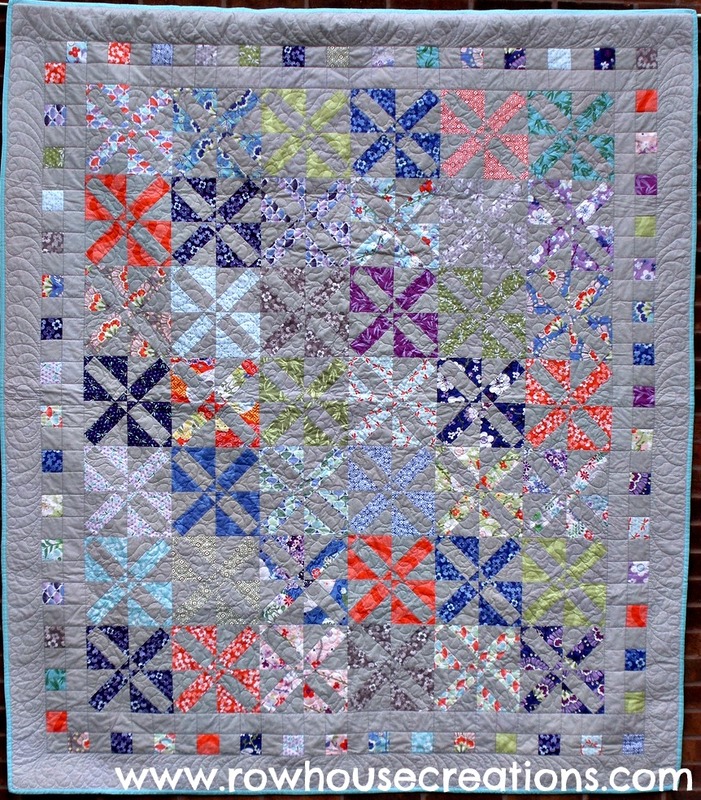 Version #2 is G.O.R.G.E.O.U.S.–but it too, did not make the cut as our cover quilt, for different reasons than version #1. So we went back to the drawing board. This pattern has been written and re-written, added to and simplified, revised and rethought– all in the name of releasing the best. possible. product. we. can. Congrats to Sherry, at Blessings from our Nest, the winner of our Sew Mama Sew Giveaway, and recipient of her very own One Big Cabin pattern! For those of you who would still like to own your very own copy of One Big Cabin, purchase one from our shop by 5 PM CST, 6/1/2012 and receive 10% back. Thank you all for your wonderful comments and suggestions! We are aware that this happened before market, but we didn’t get the post up until TODAY! It was 6:00 am on a Friday May 4th, we’re standing in Trina’s kitchen filling our travel mugs with iced coffee getting ready to jump in the Beetle and head East. Anyone who knows us, knows it isn’t every day you’ll find us vertical at that time in the morning. 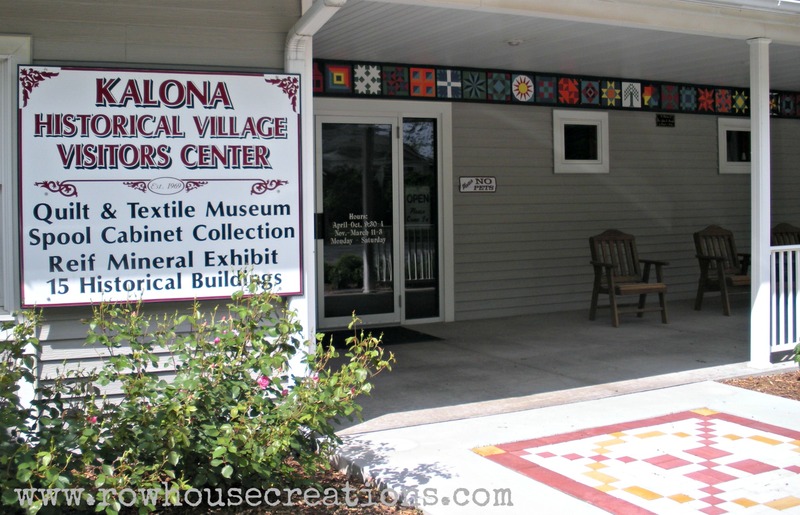 Our plan was to hit as many Iowa Quilt shops (East of Des Moines) as we could, to show off our One Big Cabin quilt and hopefully sell them a pattern or two. We had butterflies in our tummies at the thought of someone rejecting our “baby”; but how else do you sell and distribute your patterns when you are a brand-new company and no one really knows about you. It was an eventful morning; Trina whip-stitching binding on the fresh sample she took off the long arm four hours earlier (seriously! ), while Doris navigated through a torrential downpour, at one point losing sight of the 18 wheeler in front of us. Thankfully, the skies cleared and we reached our first destination, Heartland Cottons in DeWitt, Iowa. Owner Sherry was just the friendly face we needed to see to wash away the nerves and give us the confidence we needed to make that first sale! DeWitt is at the far Eastern edge of Iowa, along the the Mississippi River … so we started there and made our way back West, visiting 8 shops and making 7 sales!!! On the journey we stopped in Kalona to check out the Visitors Center. 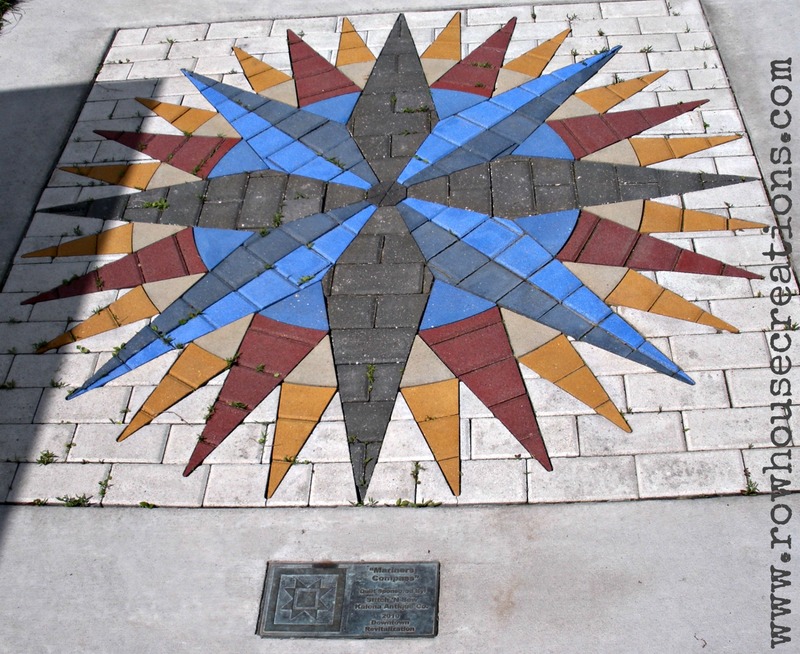 Great sidewalk quilt blocks all over town and great quilt blocks on the visitors center. It was the day before Cinco de Mayo, so we celebrated our successful day with dinner at a Mexican restaurant (our fave!) before heading home for the night.